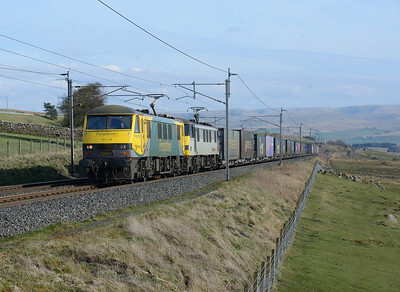 90042 + 90047 haul Coatbridge-Daventry containers near Oxenholme on 13/4/19. 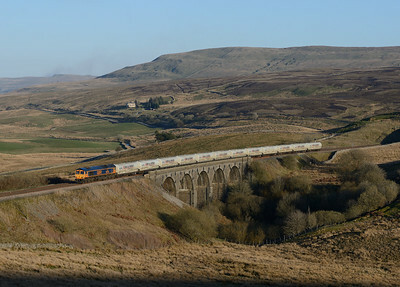 66736 crosses Lunds viaduct with the Castle Cement tanks on 10/4/19. 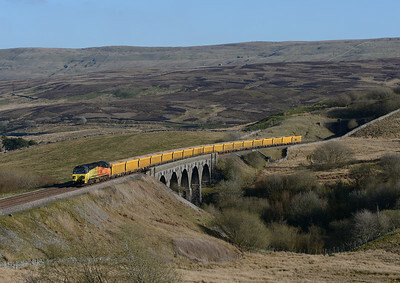 70812 hauls the Mountsorrel-Carlisle ballast over Lunds viaduct on 10/4/19. 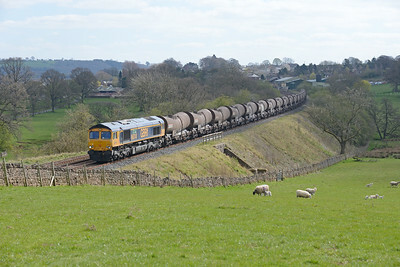 66741 "Swanage Railway" hauls the Wembley-Irvine tanks at Lazonby on 10/4/19. 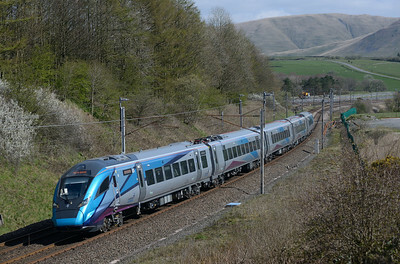 New TPE EMU 397003 passes Beckfoot on a training run on 10/4/19. 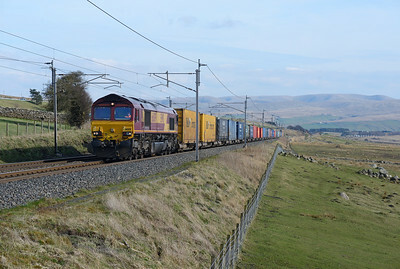 90047 + 90045 haul Coatbridge-Daventry containers near Oxenholme on 10/4/19. 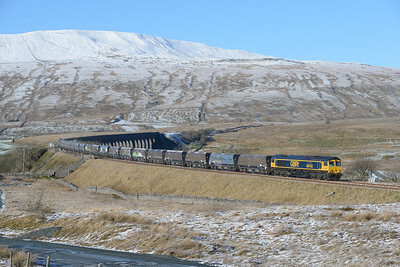 68030 "Black Douglas" passes Shap Beck with a Longsight-Carlisle TPE training run on 10/4/19. 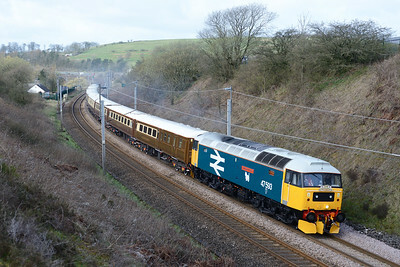 67006 & 67005 top & tail the royal train at Woodhouse on 8/4/19. 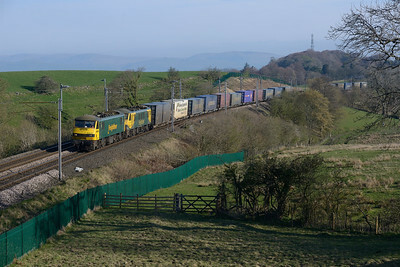 90047 + 90045 haul Coatbridge-Crewe containers near Oxenholme on 7/4/19. 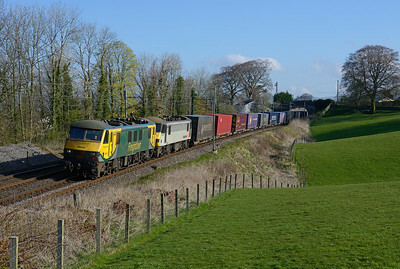 90045 + 90047 haul the Daventry-Coatbridge containers past Salterwath on 6/4/19. 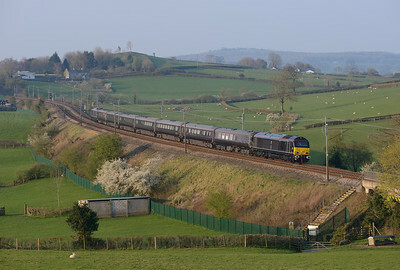 66089 staggers past Salterwath whilst 90045 + 90047 can be seen following in the distance with another train from Daventry, 6/4/19. 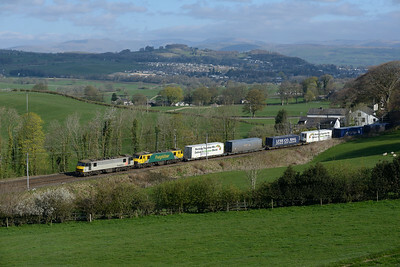 88008 "Ariadne" passes Hayfell with the daily Tesco train on 6/4/19. 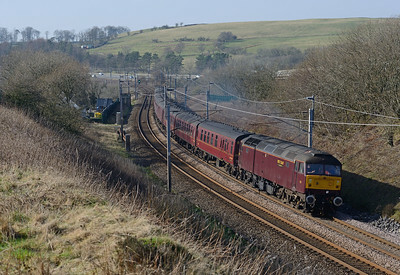 90041 + 90042 approach Oxenholme with Coatbridge-Daventry containers on 6/4/19. 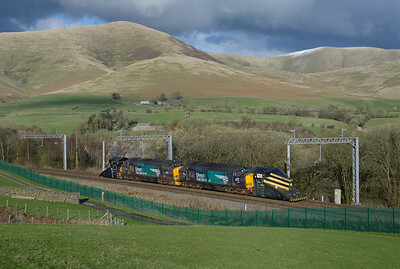 37059 + 37218 pass Lowgill with independent snow ploughs en route from Motherwell-Crewe on 2/4/19. 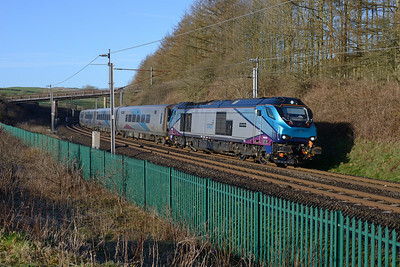 68026 "Enterprise" passes Beckfoot with a Manchester-Carlisle TPE training run on 25/3/19. 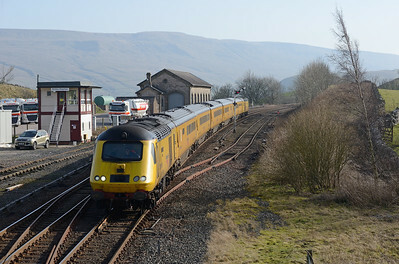 47593 "Galloway Princess" leads a Milton Keynes-Fort William Statesman at Lowgill on 23/3/19. 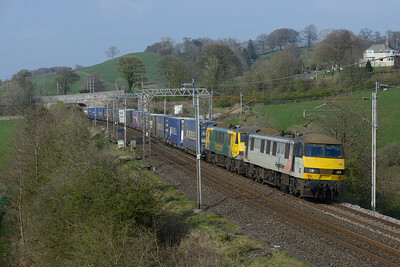 88002 "Prometheus" passes Docker with the Tesco train on 9/3/19. 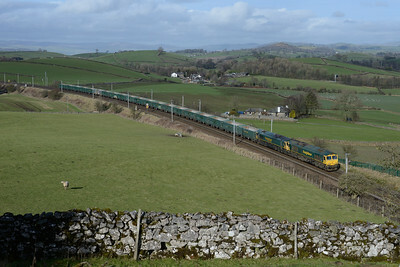 The Derby-Heaton NMT passes Kirkby Stephen on 23/2/19. 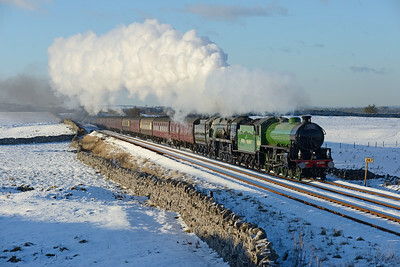 Substituting for a failed steam loco, 47826 passes Lowgill with the Cumbrian Mountain Express on 23/2/19. 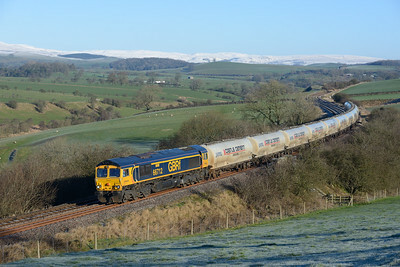 66522 and failed 66614 pass Hincaster with the Hardendale-Guide Bridge empties on 16/2/19. 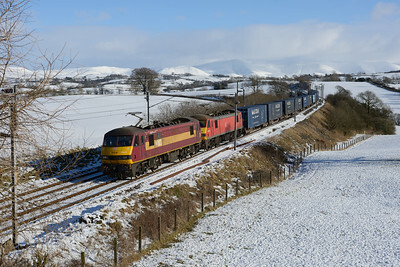 61306 "Mayflower" and 35018 "British India Line" approach Kirkby Stephen with a Winter Cumbrian Mountain Express on 2/2/19. 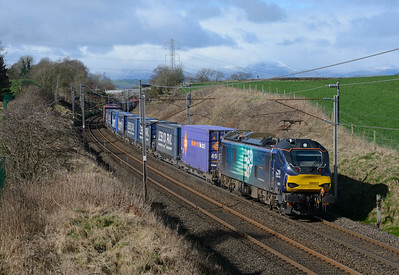 Tatty 90037 leads 90040 past Docker with Mossend-Daventry Malcolm containers, 2/2/19. 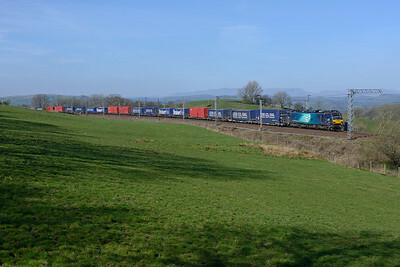 68004 + 68002 pass Furness Abbey with re-timed Crewe-Sellafield flasks on 2/2/19. 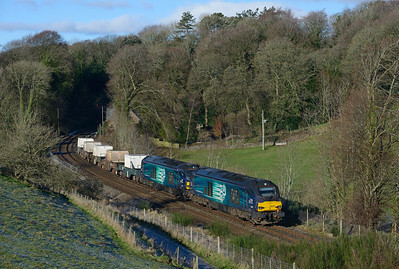 68018 + 68034 pass Plumpton with Sellafield-Crewe flasks on 2/2/19. 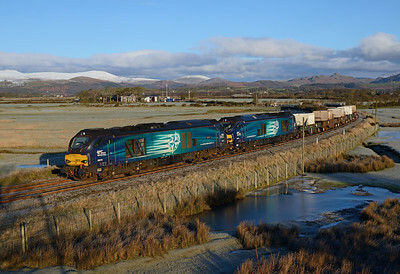 68018 + 68034 approach Kirkby in Furness with nuclear flasks for Crewe on 2/2/19. 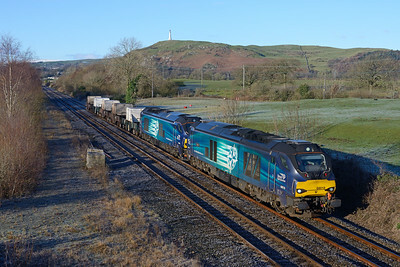 66740 "Sarah" toils past Salk Lake with the Wembley-Irvine china clay tanks on 23/1/19. 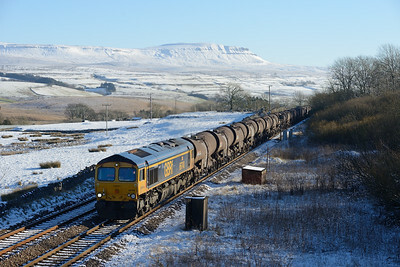 66742 "ABP Port of Immingham Centenary 1912-2012" passes Ribblehead with an Arcow-Pendleton stone train, 23/1/19. 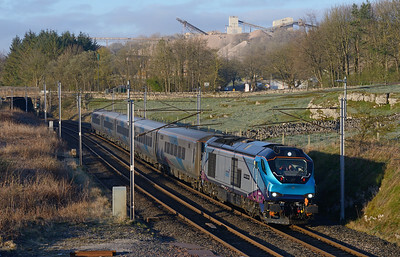 66712 "Peterborough Power Signalbox" passes Newsholme with Castle Cement empties to Clitheroe on 23/1/19.